When it sinks in. When it sinks in that visiting artist Gregg Schlanger chose to focus his considerable talent on McMaster's Parking Lot "M" for his contribution to the Mapping Paradise show, it ignited a thrill in me: here is art speaking a new language on a current environmental issue. That the issue is central to what I've been working on for the past several years felt like affirmation, yes, but more, like a new force has joined the cause, which has grown to include so many within just the last year. 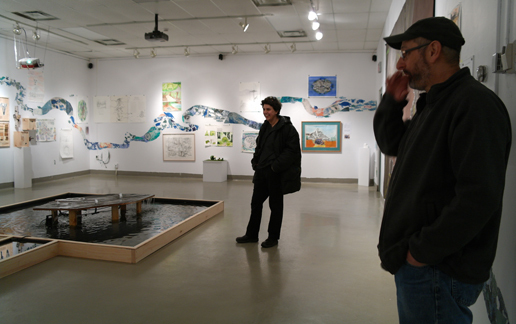 Gregg's work entitled "They paved paradise and put up a parking lot" is the central defining artwork in a lively show of student work from Judy Major-Girardin's ART 2ER3 "Environmentally Responsible Studio" class at McMaster University. The form is a low wood frame box filled with water in the middle of the gallery, with a raised, flat platform - like an oil rig in the sea - standing over the water. The platform is at first unfamiliar, until we see it in the shape of McMaster's Parking Lot M in the west campus. The student work in the show reveals a maturity and expressive tenderness, as in Alana Petrell's soft-modelled clay baby turtles who are in a place where a road (Cootes Drive) endangers their survival, and their ghostly yet earthly eggs, the laying of which send the turtles on a dangerous and often deadly journey for a suitable nesting site; all so small and vulnerable to the human-built conditions, the cars and trucks speeding past. The show is only up for the weekend, 1-4pm in Togo Salmon Hall room 114. It is worth making it part of your weekend, and you can check out the inspiration for the art by walking the trails in Cootes Paradise behind the gallery, or venture over to Parking Lot M to see for yourself what squats there, mostly empty, while the waters that once gave it special place status are diverted to drains. Stand there and survey the damage, and let it sink in.